As the fast development of 2D barcode recognition technology, it has been introduced into various industries. 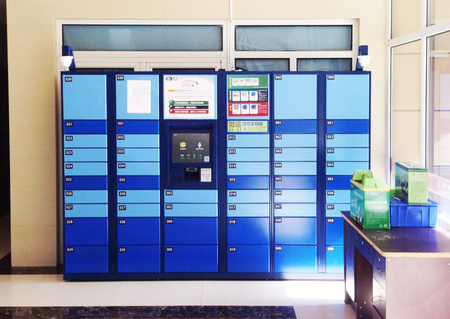 To solve the asynchronous working time problem that between courier and sender/receiver, smart logistic lockers are widely deployed in many cities, which largely cope the inconveniences caused by traditional courier service mode. A fixed mount barcode scanner is embedded into the smart locker, which can read the barcode in the express waybill or on the mobile phone screen quickly. People can pick up or send parcels by scanning the barcode at ease. Armed with international leading decoding technology, Newland Fix Barcode Scanner FM30 fixed mount barcode scanner excels at reading various barcodes on LCD/ mobile and printed barcodes and various screen barcodes. The combination of IR sensor/ light sensor exhibits an improved triggering sensitivity, FM30 can instantly start up and turn on the fast infrared sensor when the object is approaching. The FM30 is not only providing a flexible and easy-to-use barcode scanning solution for logistics lockers, but also widely used in the self-service cabinets, gates, and various O2O applications to provide services for more convenient life.